Stunning, stylish and daring. 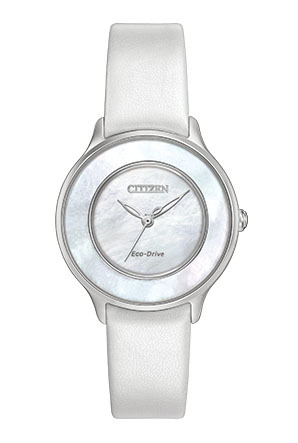 CITIZEN® L is an iconic collection made especially for women. Shown in a stainless steel case, with a pearlized white synthetic patent leather strap, featuring a white Mother-of-Pearl dial and a dual curved sapphire crystal. Water resistant up to 50 metres.